We’re already over a month into year 5! We got back August 9, spent a couple weeks helping orient the new staff, prepping for the new school year and getting settled. Jeff had 2.5 weeks with students and we had 4 days of U14 Girls’ Soccer tryouts before Eid Al Adha. Today is our last day of a 9-day staycation (our longest ever) before we head back to school tomorrow. During the break we’ve been able to get some things done around our apartment. 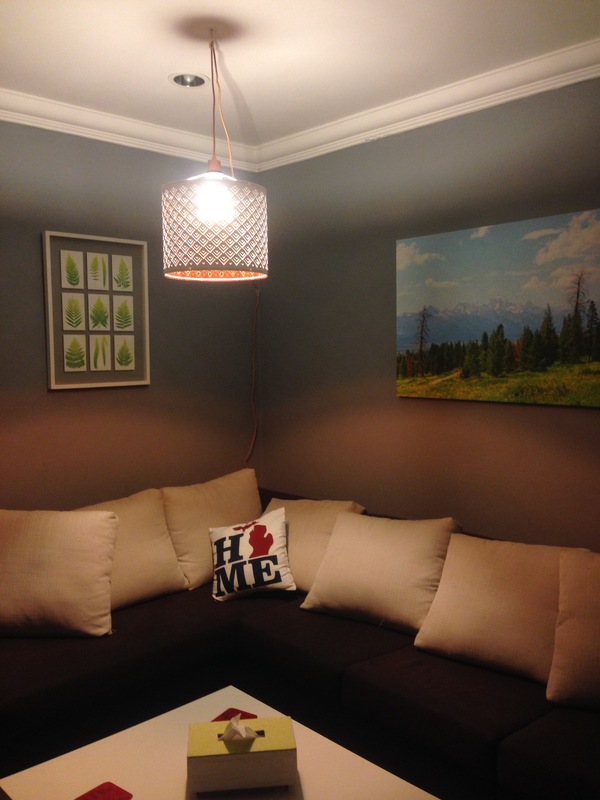 We’ve slowing been improving our apartment since we moved to the 15th floor after our 1st year so this break we did a few more updates: two pendant lights, curtains in the bedrooms and a honeycomb shelf. Our apartment definitely feels like home 😍 Come visit anytime! Surprisingly, we’ve had a lot of questions regarding what it is we do all day/every day. The secret is…. about the same thing we did in the States. But slightly different. 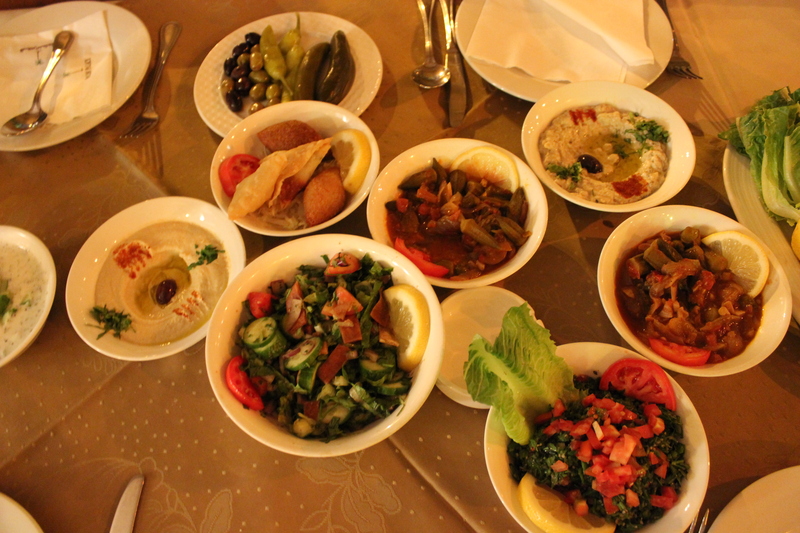 – After work we go to the gym, cook & eat dinner, maybe have something special to do (Arabic classes), and go to bed. The order in which we do these things differs on a nightly basis. – On weekends we get things done around our apartment, work out, go shopping, etc. – We wear fairly similar clothes as we would in the states, though I don’t wear shorts very often and Lissa dresses more modestly. The only times Lissa has worn an Abaya or Hijab has been during a cultural event where increased sensitivity has been asked of us. – We grocery shop more often. Produce goes bad quicker here and fresher is better in regards to unprocessed foods. – We walk almost everywhere. – Compared to where I’ve lived before, the streets are dirtier and less kept than I’m used to. Holland does, after all, keep their streets pretty clean. Like I said, it’s basically the same. In fact, we live in a more developed area here than we did in South Carolina. I’d post a map with where we go, but that sort of thing isn’t a good idea even in the US 😉 We walk 5 minutes to work, 15 minutes to the gym and 10 minutes to the grocery store. It’s pretty normal stuff. By the time we made it to our apartment and got our luggage, it was about 3am on Saturday morning (August 25). Orientation started bright and early on Sunday morning at 8am! We quickly realized the school’s goal was to keep us busy all the time for the first several days we were in the country. Most likely they wanted us to get over jet-lag as quickly as possible and keep us out of our empty apartments. As I try and think back to those first 4 days in the country now, they are definitely a little blurry! Saturday, August 25 ~ We headed to Jeans Grill on the Gulf for breakfast with all the new staff, their children and the admin team. It was a huge buffet and a great time to sit and talk with the other new teachers plus get a heads up for what was happening in the days ahead. After breakfast, we headed back to the school for tours and administrative stuff (we got our settling allowance, handed in our passports & got our pictures taken to get the work visa process going). After some lunch & computer time, we headed to the Sultan Center for our first shopping trip. It was quick and we were completely overwhelmed! So much stuff we weren’t used to seeing and we didn’t really have a good idea what we needed & didn’t need right away. Plus all the prices looked so funny! That evening, we returned to our apartment building to have dinner with at our building host (Deb has been great!). It was relaxing and we had a great time asking questions and getting to know the other new teachers in our building. Sunday, August 26 ~ We walked to school for the first time with our building host (Deb). We had time for coffee & tea with the other new teachers and then headed to a cultural presentation by the middle school assistant principal. She’s been in Kuwait for 19+ years after meeting her Kuwaiti husband at college in Florida. Her husband is part of the royal family in Kuwait (Al Sabah) but he is not part of the ruling line. It was a great presentation! I’ve asked her if she would be willing to share it…so hopefully you’ll see it soon too! We also got to try dates (not as dried as I’ve had them before) and Arabic coffee (which doesn’t taste like coffee, so I liked it!). The rest of the day was spent in a Q&A session, getting to know our divisions (elementary, middle school, high school), and time to organize our apartment. That evening we went to the Avenues for the first time…I thought the Sultan Center was overwhelming! The Sultan Center has nothing on this mall (we went again today and I’m still overwhelmed!). On the way to the mall our bus had a fun little adventure…our bus blew a tire! We had to sit on the bus on a busy highway and then transfer to the new bus…all with crazy drivers whizzing by! But once we finally got shopping, it was great to finally get some things to make our apartment less empty! Monday, August 27 ~At school in the morning we attended our divisional meeting before heading out to get fingerprints. We were told it could last 20 minutes or 4 hours. Let’s just say that our trip was anything but short & pleasant. Our appointment was at 1pm but when we got there they said it was supposed to be at 2pm. We didn’t actually get STARTED until 3:30pm. They wanted us (50 teachers) to be quiet…no one seemed to be able to. A young, short man was constantly yelling at us (we later found out he was a police officer). Once we finally started getting printed, one of the men was taking smoke breaks every couple of minutes. While I (lissa) was in the room with a few other girls waiting to be printed, a very official looking officer came in and started yelling at the ‘break’ man. Turns out he was a police office too and wasn’t in uniform. Some operation they had running there! I left about 5:30pm and none of the guys had even gone yet. Jeff got home just before 6:30. We rested for a few minutes and then met up with the group again to go to LuLu Hypermarket (think Walmart) way out of the city near the desert. We were again overwhelmed, but getting better at the whole shopping thing. I noticed that the grocery stores here are an interesting mix of ones I’ve seen in the US and France. Tuesday, August 28 (last day before returning staff joined us) ~ Our last big hoop to jump through was our medical visits. Even though we had been medically cleared in the US (and paid LOTS of money for it unlike our Canadian colleagues), Kuwait still needed to make sure we were healthy in order to give us our work visas. Our first stop was to get our blood drawn. There were lots of immigrants at the public medical center (we were happy to hear our health insurance is for private care). One of the teachers who was here last year recognized the logos on the immigrant workers uniforms and told us that they worked for a large oil company. We also heard that it’s common for the company to keep the workers’ passports so that can’t leave. People come here to work because they can make ‘good money and send it back to their families. Then they realize how horribly they are treated…and can’t leave. Glad to know we’ll be getting our passports back as soon as our visas come through! After all the women in our group were done, we had to go to another medical facility to get our chest x-rays (all the men were able to complete the check-up at the first stop). We got to wear awesome orange dresses…which reminds me I need to get a picture from my friend so you can see how great I looked 😉 That afternoon we went back to the Avenues and also went to True Value Hardware (except it had everything, not just hardware). 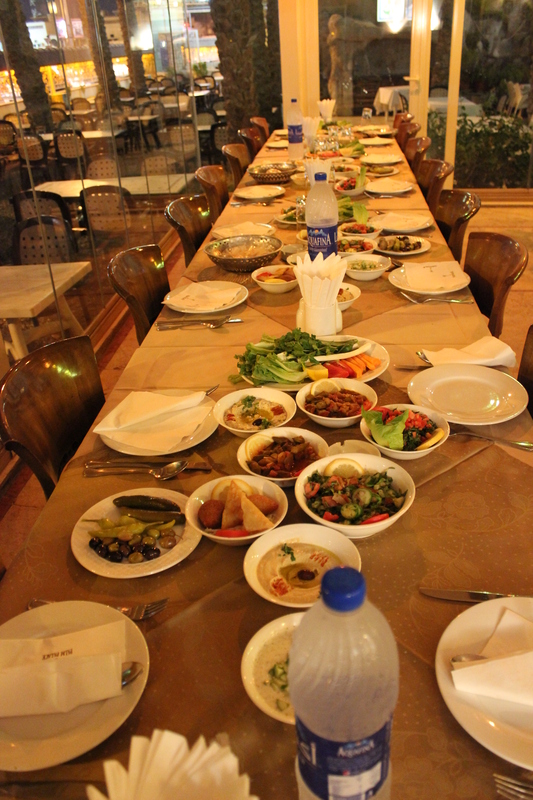 That evening we went to a traditional Arabic dinner…AMAZING! We got to try so many different types of food and drinks and it all just kept coming. YUM! 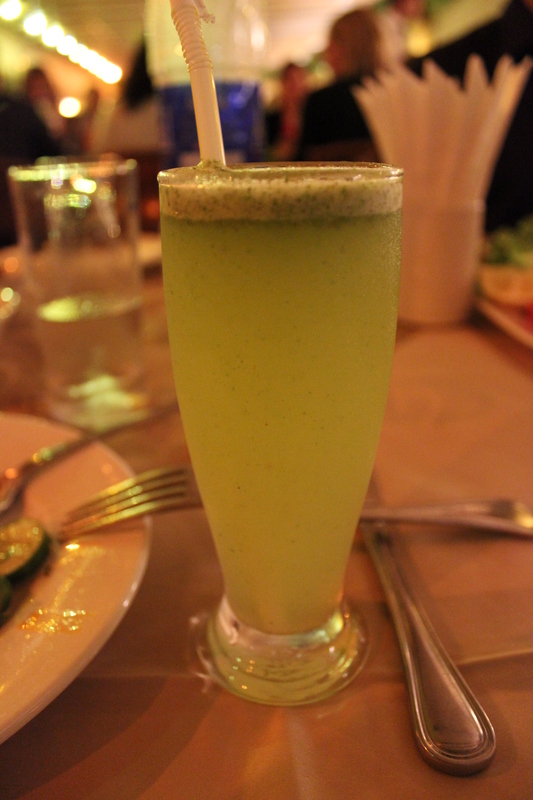 Lemon Mint – the drink we were told we had to drink at dinner! Like a virgin sweet Mojito! Sorry for the hiatus! Students came back to school on Tuesday and we’ve been busy! I (lissa) am currently teaching 3 sections of French (grade 9, 10 & 11) until the new teacher arrives. She’ll be here late Sunday night but I’ll probably be teaching for her all next week too. So I told you about how we got to Kuwait…but we did actually leave the airport 🙂 All of the new staff met the admin & their families on the other side of the alcohol scanners. We all labeled our bags with our building number and apartment number so the porters could load them on the appropriate trucks. They had water & snacks for us while we got organized and waited for the buses. We were exhausted and it was quite overwhelming to be surrounded by so many new faces. We were incredibly surprised at how BUSY the airport was after midnight on a Friday night. We finally boarded the buses with the other people in our apartment. Now that we’ve been here a couple weeks, I don’t even really remember that bus ride in…it seems so long ago! When we got to our apartment building we met our building host (Deb is in her 2nd year here and is the Middle Years Programme Coordinator) and she gave us keys to our apartments. We waited (and waited) for the truck to arrive with our luggage, but it gave us time to ask Deb questions about everything we could think of. When we finally got up into our apartment (we’re on the 7th floor of 17, 2 apartments on each floor) we were a little surprised at how big it was…but also how sparse it was. 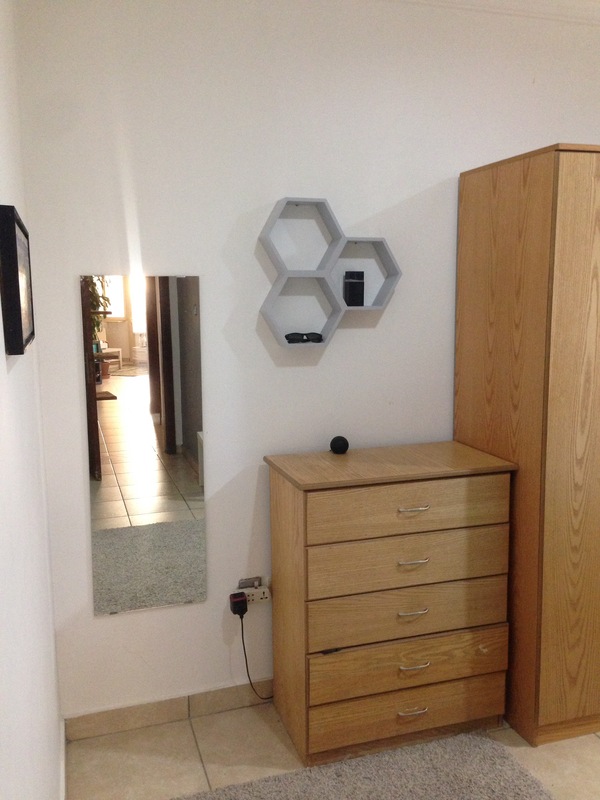 We were told it was furnished and it was…but with much less furniture than we had expected. It’s a two bedroom, 2 bathroom apartment with an open entrance/living room/dining room and a kitchen. We’re allowed to do pretty much anything we want to our apartments. Our unit was not repainted after the last tenant left. If we pick out colors before the school repaints for us, they’ll do the painting how we want it which is really exciting! It’ll be nice to have some color and make the place our own. During the last 2 weeks, we’ve been to the mall several times and used almost all of our 600KD settling allowance. 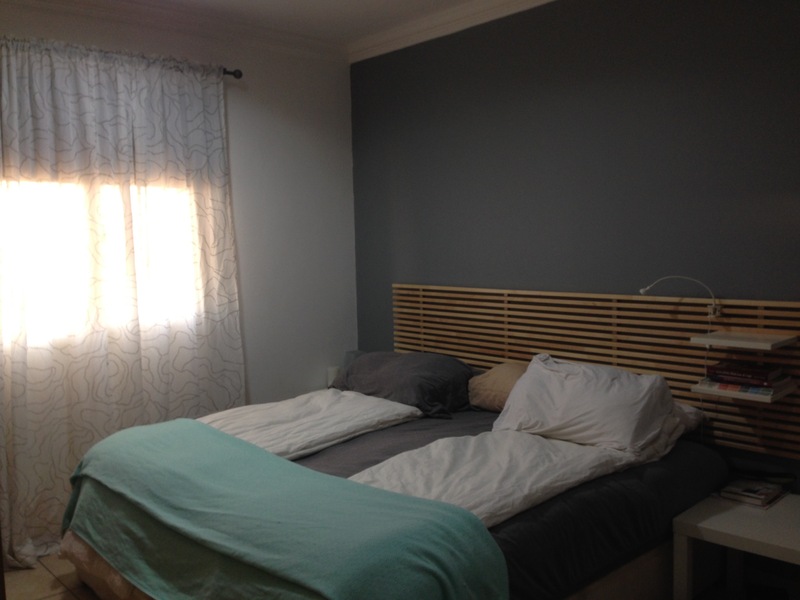 Ikea has become our new favorite store and we longingly browse Pottery Barn wishing we could afford it 🙂 These pictures are of our apartment the night of and the morning after we arrived in Kuwait. 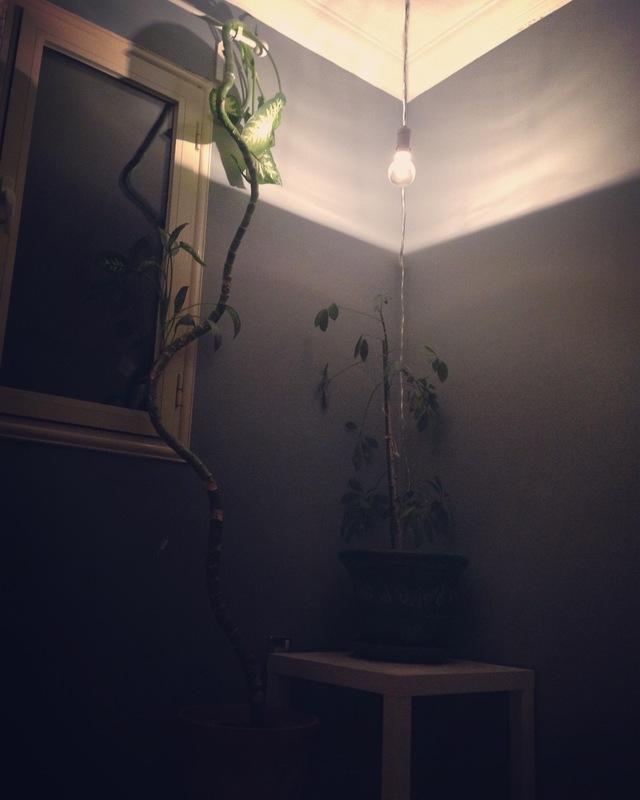 Hopefully in a few months (after we get paid) we’ll have new pictures to show you of a cozy, homey apartment! 1. In the summer, the hot water setting is actually “cold” and the cold water setting is actually HOT! 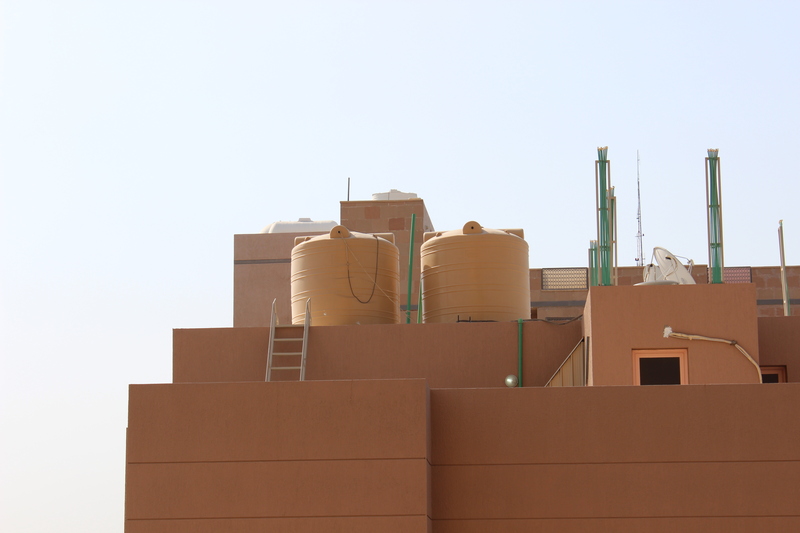 The water is stored in large containers on the roof of our building. Because it is so hot in the summer, the water that comes directly to our faucet is hot from being stored on the roof. We also have water heaters for the bathrooms and kitchen. We can turn it on in the winter when the water coming from the roof will be cold and the water from the hot faucet will go through the heater. Large water tanks on top of apartment building. 2. 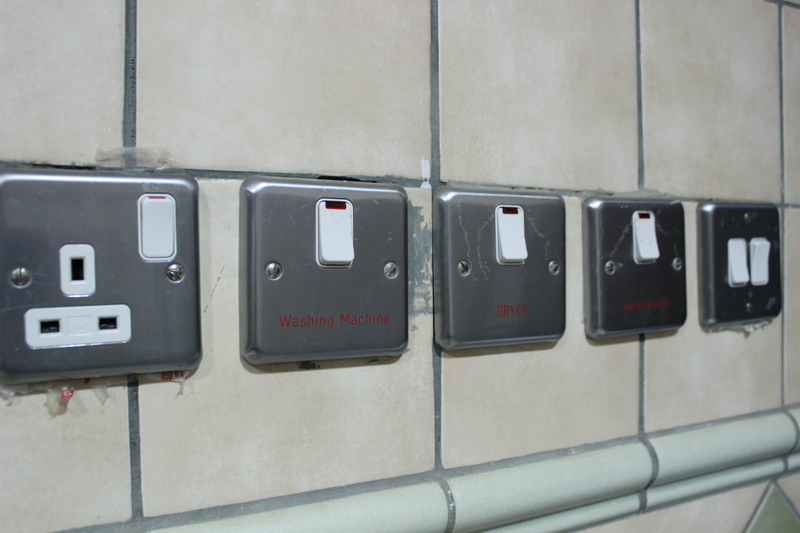 The switches for the bathrooms are outside the room. Switches for master bathroom (outside of room). 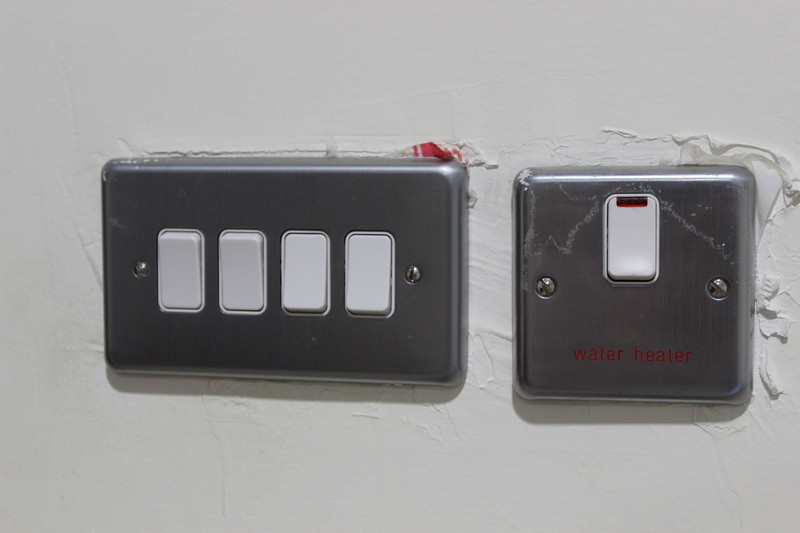 Switches in the kitchen (washer, dryer, water heater, lights, fan). 4. Most people don’t use toilet paper. We’ve heard that the pipes here can clog easily. So people clean with sprayers that are by every toilet (yupp…EVERY toilet we’ve seen has one of these with it!) and then dry themselves with toilet paper that they throw in small garbage cans that also accompany every toilet. We haven’t adopted this practice just yet.